Normal wash is the process in which heavy or slight soiling is removed and transferred to the water in the form of a solution or dispersion. This wash consists in washing garments in hot water with adequate detergent and softener, rinse in plain water and dry in tumble dryer until it is 100% dry. Some sodium is added to lend the garment a prominent washed look. 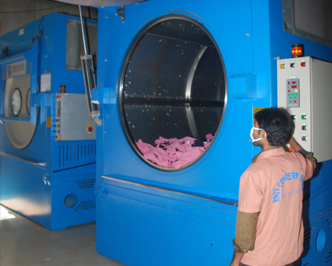 Water temperature, proportion of components of wash is adjusted as per requirement of wash and types of fabric, the garment is made of.